New report just in about a recent meteor crash in Chile this month. It attracted the interest of the Chilean air force that monitored the town after the crash. If you live in Chile and have further photos of the crash please submit them to the site using the 'submit' button above. The director of the National Emergency Office (Onemi) in the region of Tarapaca, Mario Hernandez, told La Tercera that there is no certainty about the origin of "luminous object" that was seen in the skies of Iquique between 23.30 and 23.40 pm yesterday, and that the agency responsible for issuing this information is the Air Force of Chile, Fach. "Indeed there was a very powerful light or brightness, accompanied by a trail that no one knows for sure what it is, we as Onemi what we did was monitored to see if it caused any other emergency or any involvement in the region, fortunately this did not happen. 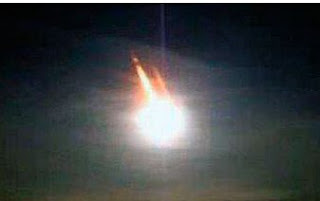 so it was a meteor.is that synonamous with a ufo ? a meteor. uhh, and now? Nothing Special, just a meteor,300 per day, and 10-20 comes to the ground. so what?